HEARS. Hearing Care for All. 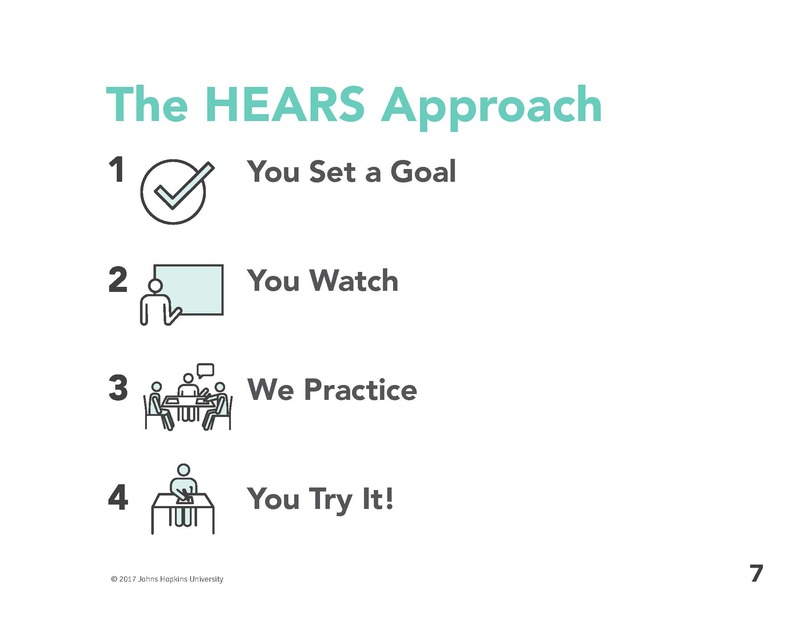 HEARS (Hearing Equity through Accessible Research and Solutions) is an accessible, affordable hearing care program that is theory-driven and evidence-based. The program is delivered by trained individuals, from community health workers with appropriate supervision to hearing experts. 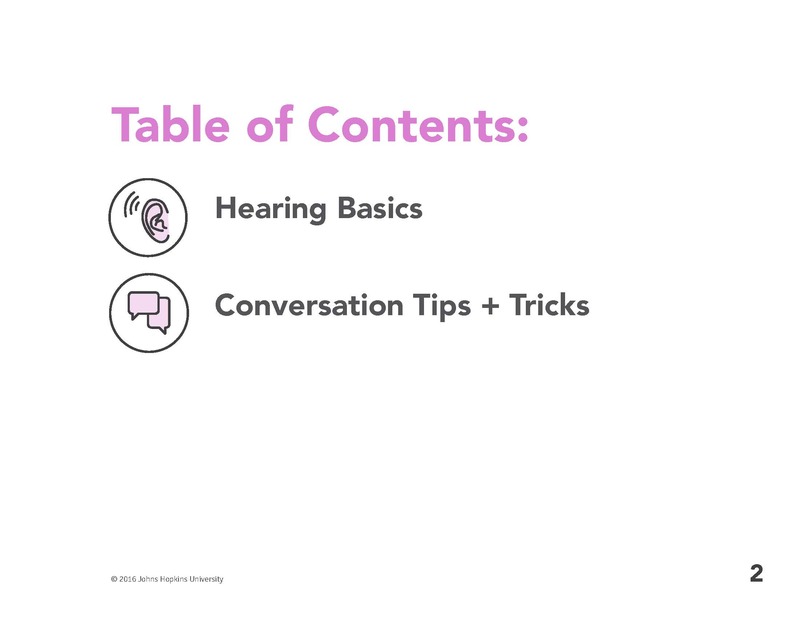 In close collaboration with the MICA Center for Social Design and a transdisciplinary team of experts from audiology, otology, gerontology and geriatrics, all training materials integrate best-practice design for older adults and empower users how to incorporate over-the-counter hearing technology into their daily lives. Hearing care in the United States typically involves multiple visits to multiple providers and the out-of-pocket purchase of hearing aids. This process demands mobility, transportation, and financial resources along with a high-degree of health literacy and executive function to navigate the complex systems involved. 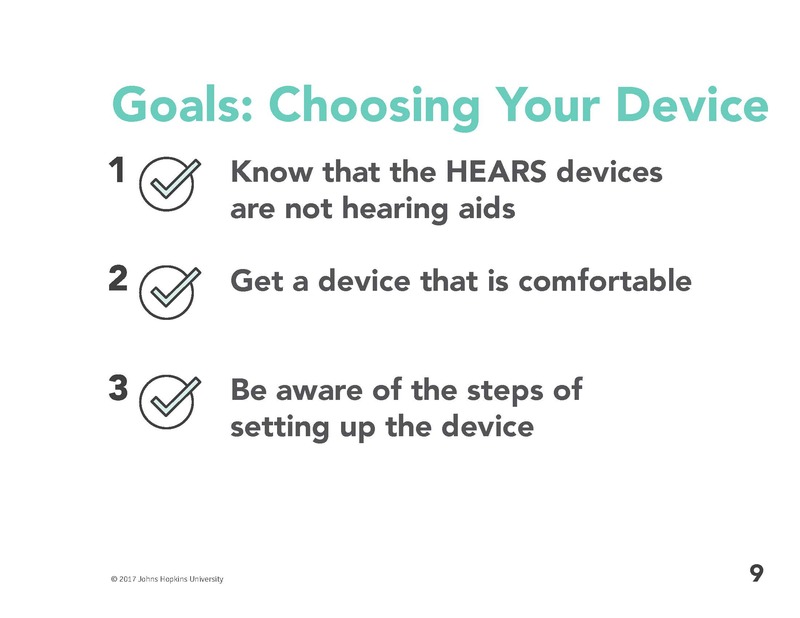 Furthermore, the vast majority of hearing aid manuals and training materials are not suitable for older adults. 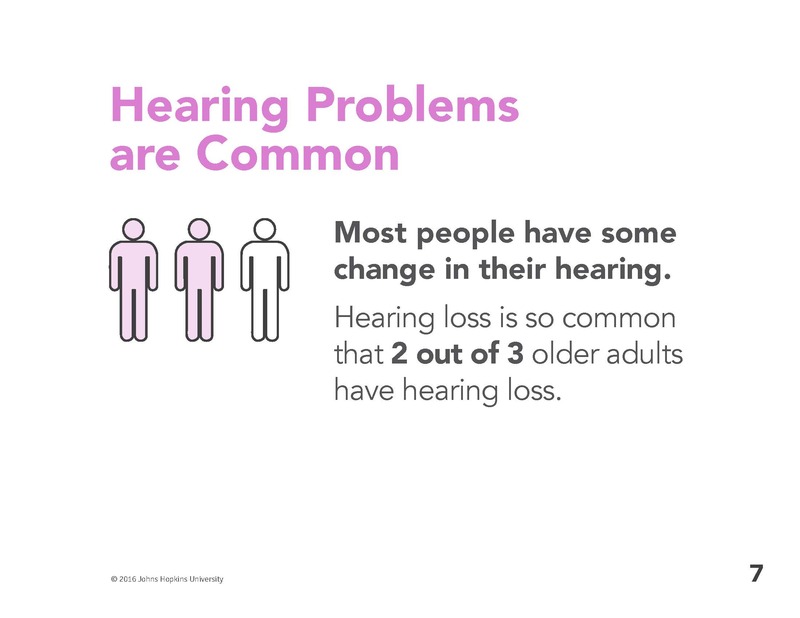 Current approaches to hearing care fail to address these barriers and do not serve the majority of older adults. 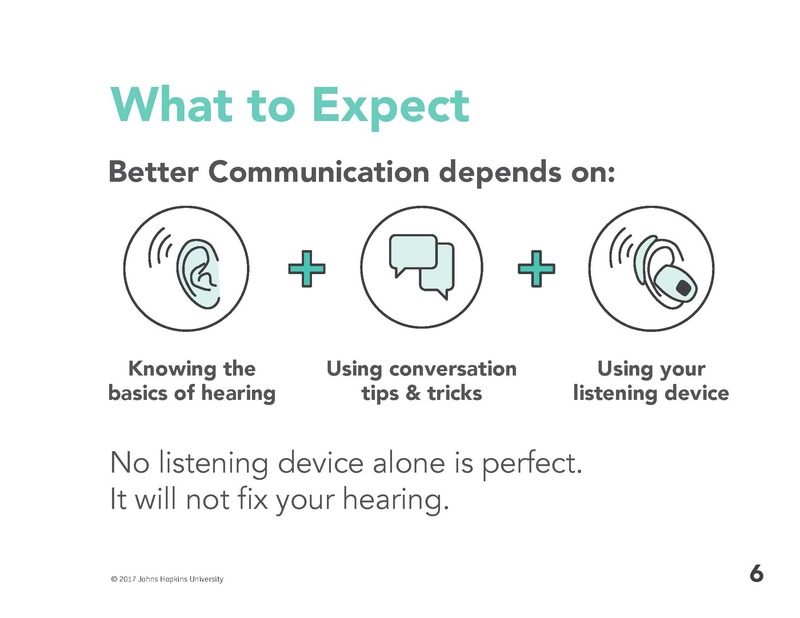 High-quality, low-cost, over-the counter listening devices are currently available and blur the line between hearing aid and amplifiers. 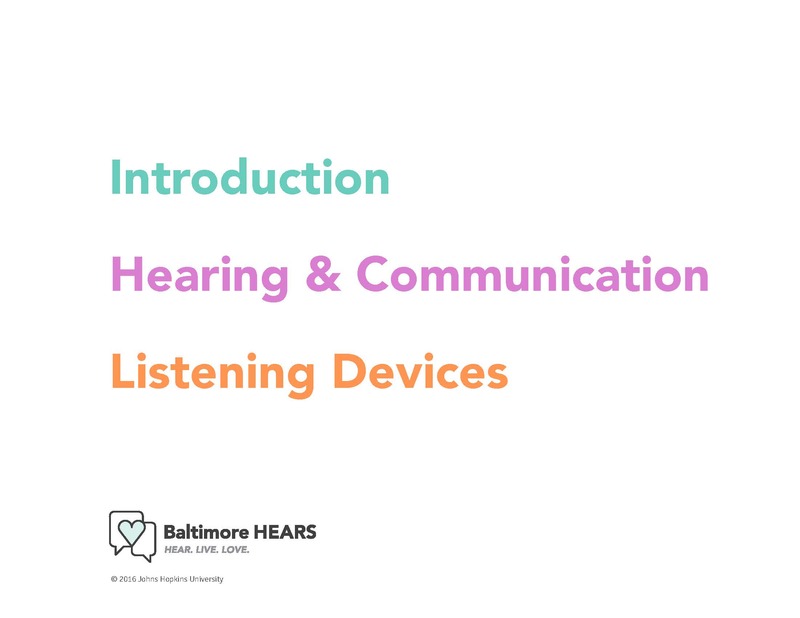 Through research by the Cochlear Center team, HEARS incorporates the current leaders in over-the-counter hearing technology in terms of sound quality and usability. 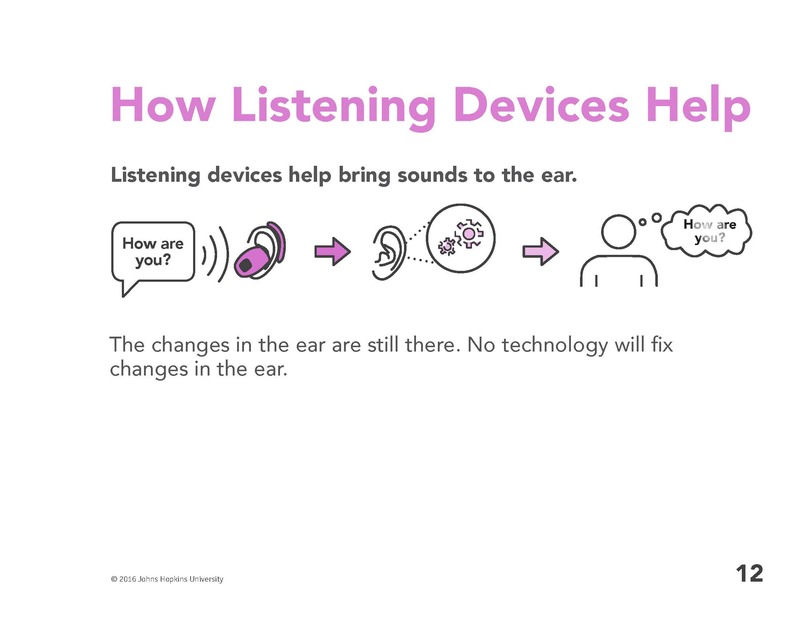 As the over-the-counter hearing technology market grows, the HEARS materials can be adapted to the latest developments and features. HEARS Teachers meet with clients in their community to deliver the program. The program can be completed in 1-2 sessions (a total of 1-2 hours) and is driven by the client’s communication goal. 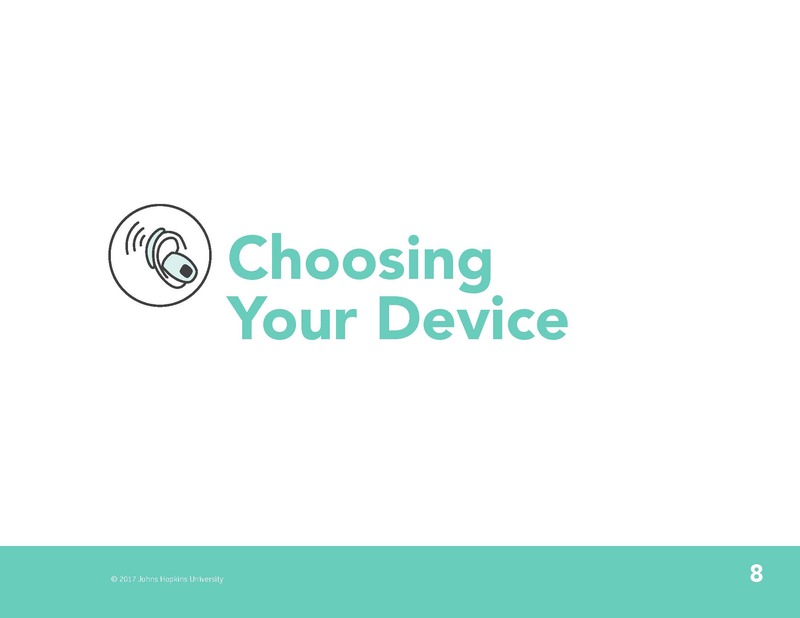 During the program, the client selects a device of his or her choice which is then fit for the client, and the teacher reviews an interactive step-by-step orientation to the device tailored to the individual’s communication goal and technology needs. 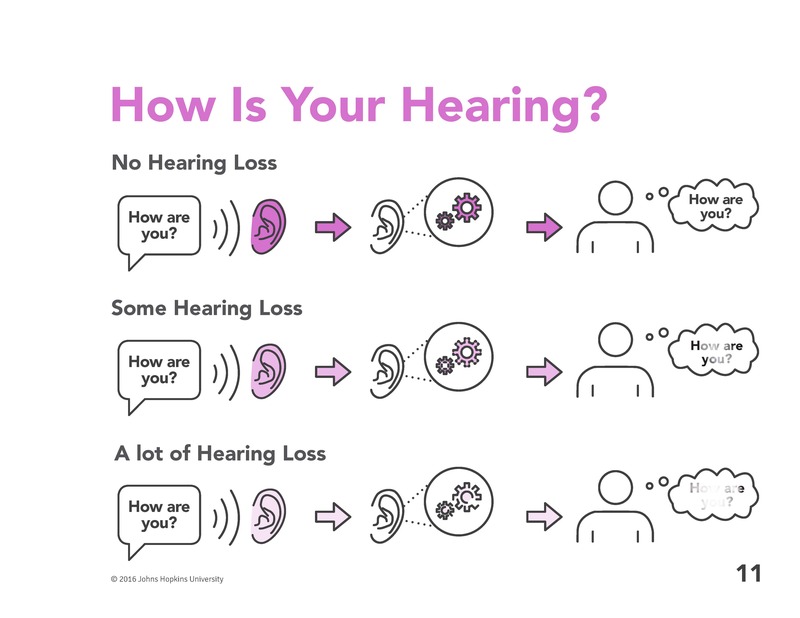 Age-related hearing loss is defined by the fundamental changes that occur in the inner ear. 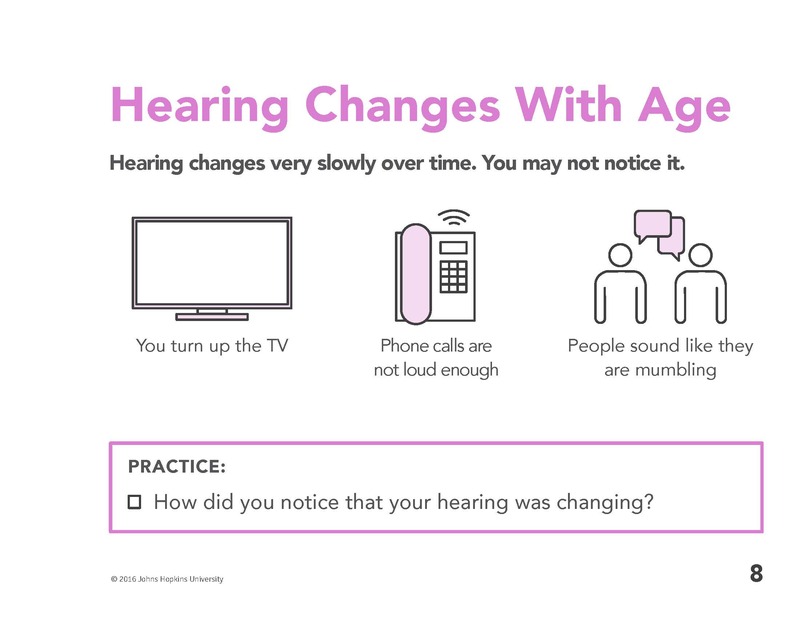 No hearing technology, including hearing aids and OTC devices, can undo those changes. 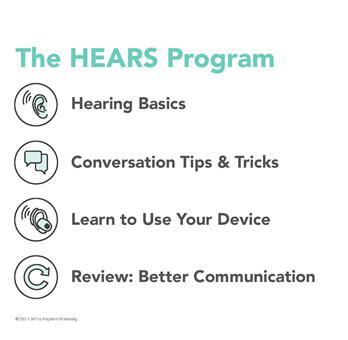 The HEARS program includes an easy-to-follow introduction to age-related hearing loss and expectations around getting the most out of a listening device. 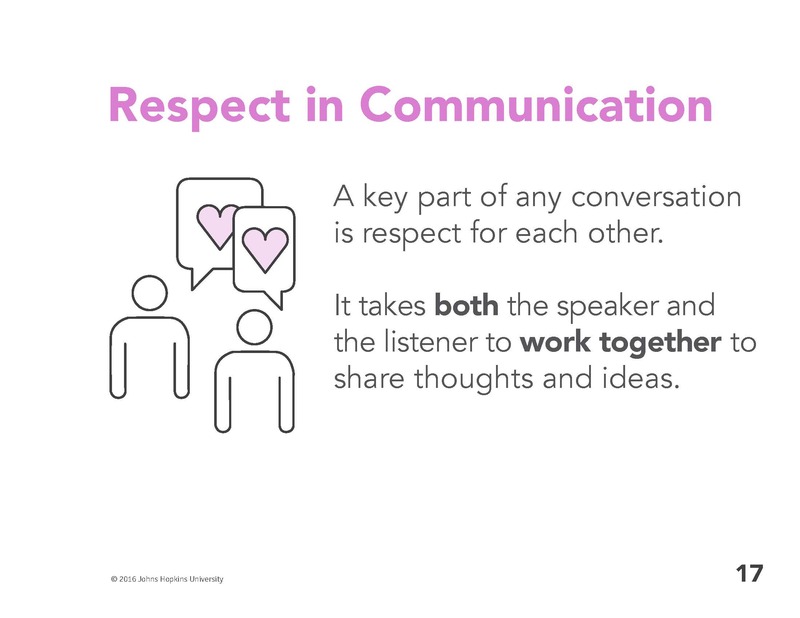 Finally, the program incorporates communication strategies that the HEARS Teacher and client practice together to equip clients with the tools they need to communicate and connect. A recent Lancet report recognized HEARS as a promising innovation in increasing access to hearing care. 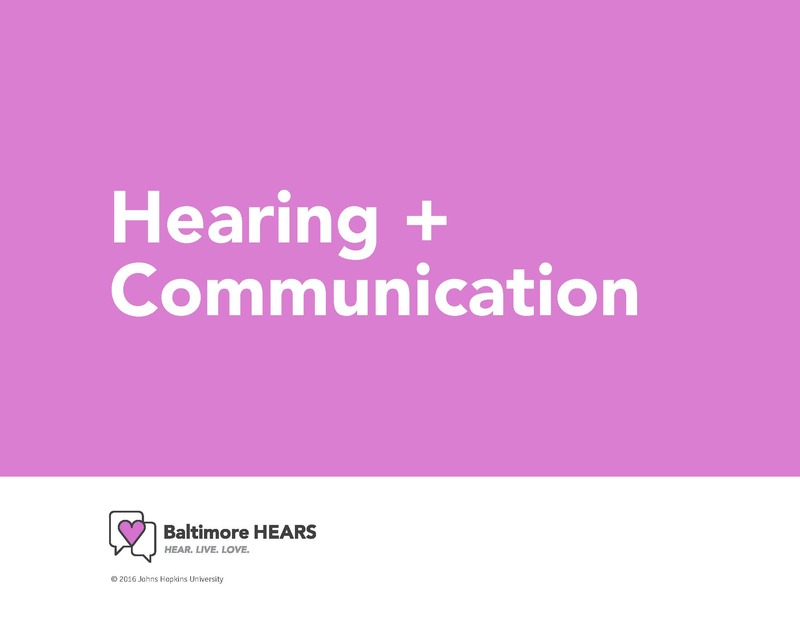 A community health worker-delivered model of HEARS is currently funded by an NIDCD R33 grant that builds upon prior pilot studies and is testing the efficacy of the program through a multisite randomized controlled trial in Baltimore. 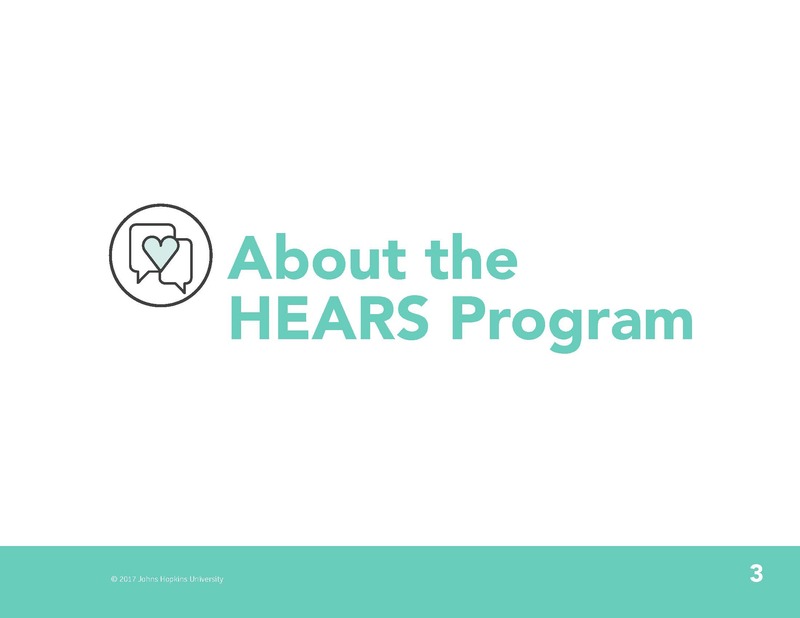 Additional models of the HEARS program have been and are currently being tested nationally and internationally. 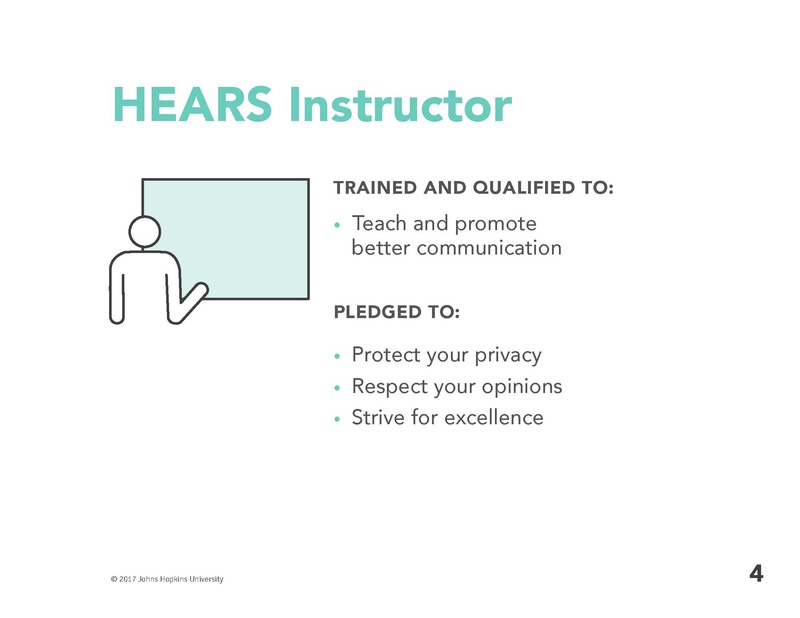 Contact Center Core Faculty Carrie Nieman to learn more about the HEARS program or visit Access HEARS.